This page is designed to honor all the men and women from Howard County Indiana who have served in any military role. The following submissions and links to pages are provided by visitors like yourself. To submit information about an Howard County ancestor who served in the military, see below. Letter from Company Clerk listing muster roll of Company D as of 12 June 1863. Information about Howard County residents who served in the military is always welcome; however, information on those still living is not posted, due to privacy concerns. Please send an e-mail to the County Coordinator, using the following format as a guide. This document is made available to the public for non-commercial purposes. If you wish to incorporate this document into any commercial product, you must first obtain permission from the author of the material. Home | Biographies & Genealogies | Cemeteries | Census | Land | Migration | Military | Obituaries | Organizations | Photo Gallery | Pioneers | Resources | Schools | Vital Records. 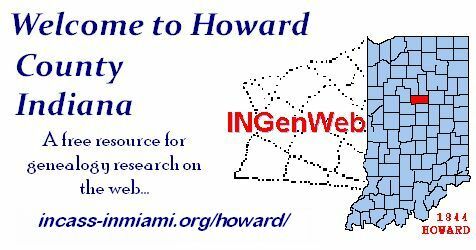 This site is not affiliated with or part of any official Howard County or Kokomo civic website. The material on this website is made available for free to the public for non-commercial purposes.